Art Allmägi’s exhibition "Paint it Black II" opens at the Tartu Art Museum on Friday this week. 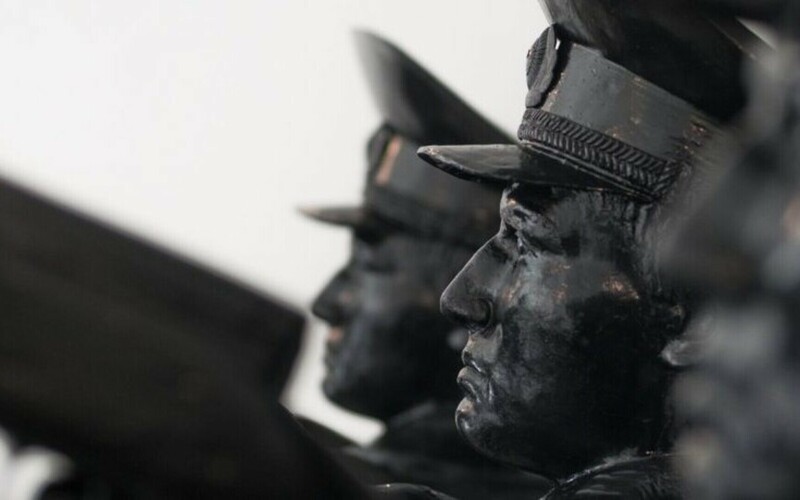 Allmägi has based his haunting work on a Russian law introduced in 2015 that allows the country’s military to obfuscate the circumstances of soldiers’ deaths. The narrative installation winds through the museum's ground floor. It was inspired by Russian politics and uses Allmägi's signature flamboyant aesthetics. It's a conceptual continuation of Allmägi's previous exhibitions, "Cold War" and "Paint it Black." The starting point of the exhibition is a Russian law passed in 2015 that classifies the causes of death of soldiers. Though completely sweeping a soldier's death under the rug is difficult, it is still relatively easy to manipulate the circumstances, making it possible to claim that the person in question had been on vacation when they died, and so on. Such deaths were reported eerily frequently after supposed separatists started their civil war against the Ukrainian state, for instance, and have since been a reason for protests in Russia both by opposition politicians as well as relatives of the deceased. Sometimes despite clearly identifiable gunshot wounds, members of the military are found to have died of a heart attack in their autopsy. In that context, human beings become a resource to be sent wherever to do whatever. The same laws also absolve the state, relieving it of any kind of responsibility towards the soldiers' families or the public. Sensitive bits in these people's files are blacked out, and attempts to bring the truth to light are against the state's interests and punished. The secrecy thus created breeds paranoia and conspiracy theories that eat away at the social and intellectual substance of the country. Art Allmägi, born 1983, is an Estonian sculptor and installation artist. He studied stone cutting and blacksmithing at Vana-Vigala Technical and Service School, and later studied at Tartu Art College and the Estonian Academy of Arts.